Last month, my husband and I spent a week in Nassau, The Bahamas, for our summer vacation. My husband's affinity for the Caribbean has grown over the last couple of years as we've visited the countries of Grenada and Jamaica. My love of the Caribbean stems from my childhood and ancestry. My father was born and bred in Barbados (St. Andrews Parish), so I spent many summers there with him, my mom, and my brother. My mother's family is from Maroon Town, Jamaica (a locale spanning the St. James, St. Elizabeth, and Trelawny Parishes). That makes me an African/West Indian gal—and a very proud one I might add! While in The Bahamas, I wondered what the prevalence of diabetes is among the people there, what it is in the West Indies as a whole, and how it compares with that of the African American population in the United States and the United States overall. After doing some research, boy were my eyes opened. According to 2017 data from the International Diabetes Federation (IDF) North America and Caribbean (NAC) Region, 425 million people worldwide and more than 46 million people in the NAC region have diabetes, and it's projected that by 2045 this statistic will skyrocket to 62 million. The IDF Diabetes Atlas, 8th Edition, shows that of the adult population aged 20 to 79, 13.6% in The Bahamas has diabetes, 11.4% in Jamaica has it, 9.5% in Grenada has it, and 17.6% in Barbados has it. These statistics are comparable to those of non-Hispanic blacks in the United States: 12.2% and 13.2% of non-Hispanic black men and women aged 18 and older have diabetes, respectively, according to the National Diabetes Statistics Report, 2017. And all together, 13% of adults in the United States are living with the disease. Sadly, diabetes prevalence is expected to increase dramatically by 2045 in the United States and in every other world country. That said, it's obvious that the world has its work cut out for it to help prevent diabetes and reduce the enormous health care costs associated with it through better patient education programs and services. This month, Today's Dietitian (TD) is featuring its second annual Diabetes Management & Nutrition Guide on page 30. 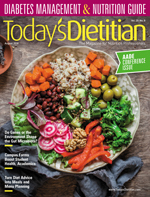 In it, you'll find articles on diabetes nutrition, bariatric surgery's role in managing type 2, digital health technology in diabetes care, treatments for sexual dysfunction, and more. In addition to reading this special section, turn to features on the gut microbiota and college farming programs. The staff of TD looks forward to seeing you at the American Association of Diabetes Educators annual conference in Baltimore. Stop by booth 850 to say hello, and please enjoy the issue!